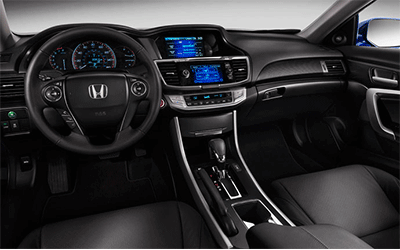 Visit Patty Peck Honda, a premier Honda dealership serving Jackson to get behind the wheel of a used 2014 Honda Accord Coupe. The most stunning Accord ever returned for 2014 better than ever. With a 26 City and 29 Highway MPG rating, equipped with the CVT transmission, drivers will find pleasure in driving past the pumps in their Accord Coupe. An efficiency expert, the available ECON button maximizes gas mileage by offering drivers the choice to have more zip or better fuel economy. For 2014, the Coupe is available in LX-S, EX, EX-L, and EX-L V6 trims. 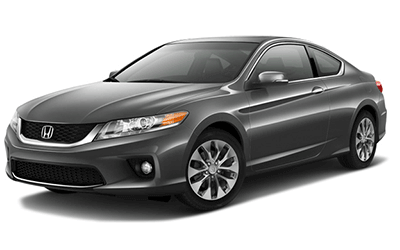 Find the right pre-owned Accord Coupe for you at Patty Peck Honda today by calling 601-957-3400 to speak to someone from our dedicated sales staff. The ninth-generation Accord lived up to the Accord reputation, while still retaining its hallmark value. This coupe has a bolder style, in addition to new technology for 2014. The IIHS’s testing program for Top Safety Pick+ awards includes new small overlap frontal crash test—sometimes called a “narrow offset” test—and is designed to replicate what happens when the front corner of a vehicle collides with another vehicle or an object such as a tree or utility pole at high speed. The Honda Accord Coupe earned glowing reviews, being one of the first coupes (along with the Civic) to earn IIHS Top Safety Pick+ honors. All Accord models, new and used feature a rearview camera and give you a clearer picture of what’s behind you when you’re in reverse. Honda’s innovative LaneWatch blind spot display also returned for 2014. LaneWatch offers an intuitive blind spot display that provides unprecedented visibility. This technology lets drivers get an up-close view of any blind-spot traffic in the right-lane from a camera display on the navigation screen as the driver prepares to switch lanes. Ergonomically designed and racing inspired paddle shifters make switching gears easier, and steering wheel mounted audio controls offer a safe way to find your favorite song. To learn more about the used 2014 Honda Accord Coupe, contact Patty Peck Honda by calling 601-957-3400 to schedule a test-drive today.